On July 12, the Grob SPn Utility Jet completed its low- and high-speed taxi tests near Lake Constance in Germany. It all started in 1971 when Burkhart Grob decided he wanted to pursue his passion of flight by starting an airplane company. With a dream and a bit of funding from the family business, Grob started building licensed Cirrus gliders at a small facility. Grob Aerospace quickly grew and expanded their product lines to include the Astir single-seat glider, the dual-seated Twin Astir and Twin III Acro gliders, and the self-launching Twin III SL glider. Grob Aerospace took its first step towards the manufacture of airplanes with the certification of the G109 in 1981. The G109 was the first fully composite motor-powered glider to be mass-produced. Each of these gliders contributed to the advancement of Grob Aerospace; however, it was the use of high-tech composites in the construction of these aircraft that would come to define the products of Grob Aerospace. As Burkhart Grob evaluated his fledgling company, he was pleased with the aircraft he had made, but he wasn’t satisfied; he wanted to build airplanes. In 1982, Grob realized his dream when the G115 received German aviation certification, which was shortly followed by Federal Aviation Administration approval, making the G115 the first fully composite non-U.S. aircraft certified for the United States. The success of the G115 brought Grob Aerospace into the training aircraft market and marked a new phase in the company’s history. This era was culminated with the fully aerobatic, high-performance G 120 training aircraft. As Grob Aerospace continued to grow, they sought out new challenges, which would test the limits of their composite craft. In the late 1980s Grob set five Fédération Aéronautique Internationale world records for altitude, time to climb, and flight endurance with the Strato 1 high-altitude research aircraft. These limits were pushed even further with the Strato 2C, a pusher-type twin-engine aircraft that has reached altitudes of 78,000 feet and has an endurance of 48 hours. After designing research, training and recreation aircraft, Grob Aerospace took the next step and entered the business aircraft market in 2003, with the Grob Ranger G160, a seven-seated multipurpose turbo-prop aircraft. As the Ranger G160 project neared completion, employees of Grob Aerospace and ExecuJet Aviation Group began to meet to discuss market opportunities for new aircraft. As a large player in the business jet arena, ExecuJet provided information on market needs, while Grob Aerospace, the world’s largest producer of composite aircraft, possessed all of the technical experience required. Combining the strengths of both of these companies, an aircraft was envisioned that would fill the gap between the capability and flexibility of a turbo-prop, and the performance and comfort of a business jet. With a vision of a flexible, multipurpose aircraft, Grob Aerospace and ExecuJet Aviation Group began their newest revolution, the Grob SPn Utility Jet. By combining composite technology with advanced engines and engine control systems, the Grob SPn Utility Jet is able to fly 1,800 nautical miles with six passengers, and 1,280 nautical miles with a maximum payload (2,491 lbs). 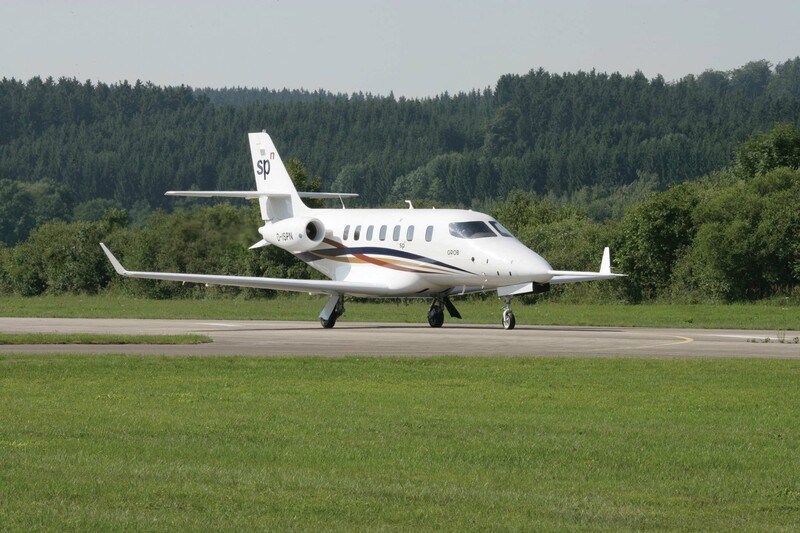 In addition to the requirements for range, Grob Aerospace also required that the utility jet be able to operate on the shorter, less maintained runways frequently used by turboprop aircraft. The aircraft only requires a balanced field length of 3,000 feet, which enables it to land and takeoff from runways previously only accessible to turboprop aircraft. In order to enable the aircraft to land on “unimproved” runways, which often consist of gravel or grass, the SPn Utility Jet features titanium landing gear and mounting components to deal with the loads of landing on an imperfect field. The aircraft also has oversized wheels and exceptional structural stiffness due to the carbon fiber fuselage and wings, both of which further enable it to land on unimproved runways. The vision of the SPn Utility Jet not only called for an aircraft that would be capable of using a variety of airport conditions, but also that would offer equal versatility in function. The jet has a total cabin volume of 405 cubic feet, and headroom of 5 feet 5 inches. It was also designed with a large passenger door and modular interior, which allows the cabin to be used in diverse applications, including air-ambulance service. While thinking about the desired capabilities of the SPn Utility Jet, Grob Aerospace decided it would be critical to make the jet so it can be flown by a single pilot, thus enabling it to replace turboprop aircraft in smaller aviation companies that cannot afford two pilots per aircraft. In order to enable the pilot to safely and easily control the aircraft, Grob selected the most advanced and intuitive avionics available. To ease the pilot’s workload, relevant flight data is displayed on two LCD monitors. The aircraft is also equipped with advanced radar and warning systems such as Traffic Collision Avoidance System and Enhanced Ground Proximity Warning System. The two FADEC (Fully Automated Digital Engine Control) Williams J44-3A engines further simplify the pilot’s job. The combination of these avionics and hardware features make the aircraft the largest private jet to be certified for single-pilot operation. As the SPn Utility Jet advanced through development, discussions began as to what to name the craft. It was quickly decided that its name should represent its attributes: superior performance, superb payload, single pilot capability, and the unlimited possibilities for its use. These components are all included in the name SPn, which represents all of these possibilities to the nth power. 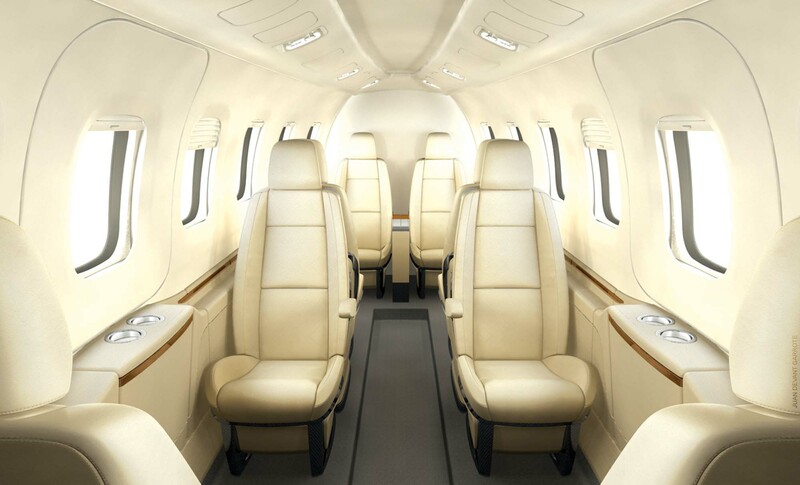 The Grob SPn Utility Jet features a modular interior, which can be easily adapted to fit different needs. The $7.1 million SPn Utility Jet will fly for the first time at the end of July and is expected to complete FAA certification during the second quarter of 2007. Whether Burkhart Grob attains his dream of creating a viable airplane manufacturing company depends largely on the success of the Grob SPn Utility Jet. However, as the only aircraft in its market, it seems that the Utility Jet and Grob Aerospace are headed for blue skies. For more information, visit [http://www.grob-spn.com].